Friars Oak Fields: Building 405-bedroom estate next to dangerous rail crossing would not lead to more people using it? Really? Building 405-bedroom estate next to dangerous rail crossing would not lead to more people using it? Really? Hassocks residents have expressed disbelief at a developer's claim that building a 405-bedroom housing estate will not cause more children to use an unguarded rail crossing next to the site. Rydon Homes' claim that only two more crossings will be made per day is ludicrous, said Friars Oak Fields Residents Association (Fofra). A Fofra spokesman said: "This is madness. Putting a big housing estate the other side of the tracks from all of Hassocks' schools and shops, and most of its housing, can only mean one thing: lots more people using it. "Kids will use it as it is the quickest way to go to school or Adastra Park, or to see friends. The possible consequences don't bear thinking about. Rydon Homes' claim is nothing short of irresponsible nonsense." Woodside crossing is just north of Hassocks station on the London-Brighton mainline, carrying 332 trains a day at up to 90mph. The electrified rail is just a few feet from the footpath and there are no barriers to stop children trespassing. At present Woodside is used infrequently by ramblers and dog-walkers using the public footpath. 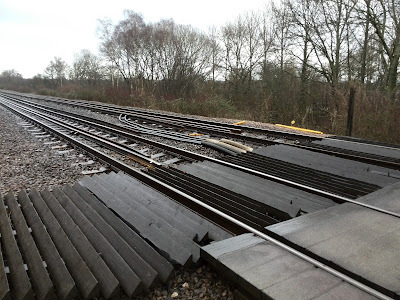 But when plans were unveiled for a large housing development at Friars Oak, north of Shepherds Walk, local people were quick to spot the potential danger and alerted Network Rail, who are responsible for the safety of the crossing. Incredibly, Network Rail has declined to object to the development. It has apparently accepted the findings of Rydon's consultants, who claim that no children - in fact nobody at all - will use the crossing between 8am and 9am. Fofra added: "It's time Network Rail took its responsibilities seriously. And since Friars Oak Fields has been rejected by local people as a housing site in the Neighbourhood Plan process, Mid Sussex councillors must surely reject this planning application. To do anything else will make a mockery of local democracy."